For most people, this function is used occasionally for something really important they simply mustn't forget. And for those people, it probably works just fine. However, for some people (like me) reminders have become an absolute necessity. I hate to admit it, but I have a really bad memory. Truly awful. For this reason, I am almost entirely dependent on Google’s system of reminders to navigate through each day. 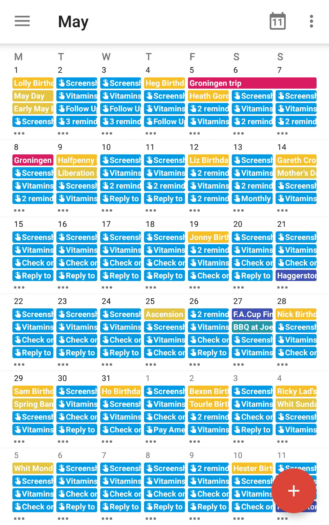 My phone will buzz with a reminder around 15 times per day. Some of these are one-offs. Some are recurring. All of them are to remind me to do something important, and without them, there’s no telling what I might forget to do. Don’t get me wrong, I am incredibly grateful that I am able to set reminders on my phone at all. But my extensive use of Google’s reminder system has also led me to conclude that it is inherently flawed. The biggest issue, as I see it, is a lack of consistency. Allow me to explain. With so many options, there’s always a convenient way to add a reminder to your Google account, whatever you happen to be doing when the need arises. Not all reminders are created equally, however. Add a reminder using any of the first 3 methods in the list and you’re offered the same basic options, such as when or where you’d like to be reminded and if you’d like the reminder to repeat. Inbox insists on using its ‘snooze’ terminology to denote reminder time, which isn’t ideal but we can handle that. Keep reminders are obviously linked to a specific note so you may not always want to use this option if you’d prefer your notes list to stay nice and tidy. They do still show up in your reminders list on the Google app, though, and can be dismissed from there accordingly. You cannot edit Keep reminders from within the Google app, however. To do that you’ll have hit the “Open in Google Keep” link and go through to the app itself. A Keep entry in the Google app's reminders list. It even includes distinct entries for recurring reminders. So if you have a reminder set to recur every day it will show up in the month view for every single day, rather than just the next instance. The result is a mess. Needless to say that completely rules out Google Calendar as a method of input for me. Unfortunately, it took a couple of missed reminders when I didn’t have the option checked to figure out that the calendar functioned in this way. This was obviously frustrating, and I was lucky not to miss out on even more important notifications before I realized they weren't showing up. Another potentially handy way to set a reminder is by searching ‘add reminder’ on the Google homepage in your browser (on desktop or mobile). Regardless of browser or OS, if you’re logged into your Google account you should be able to easily set a reminder this way. Of course, there are a couple of limitations here too. First of all, there is no option to set a recurrence if you use this input method. You can revisit the entry in the Google app later on and set a recurrence there, but that kind of defeats the purpose of being able to add it in your browser in the first place. The second issue is that you can only set the reminder for predetermined times of the day. These include morning, afternoon, evening, or night, as well as set times of on the hour (12:00) or half past the hour (12:30). This simply isn’t specific enough for certain tasks, and as a result, I tend to steer clear of adding reminders this way (except in an emergency), preferring the other more feature-rich methods. At the moment there isn’t an especially fast way to enter a reminder input from your Android phone’s launcher. The ‘OK Google’ hotword (or Google Assistant on compatible devices) is easily the fastest method currently available, but there are still many of us who don't wish to talk loudly at our phones in public. Or even in private, for that matter. It's also worth mentioning that if you use the voice method this can often lead to misunderstandings or having to type extra information anyway. The Screen Search reminder button - simply not fast enough. The easiest solution would seemingly be to have a one-tap option to go straight into a reminder from your device homescreen. Instead, we have to long-press the home button (on non-Assistant devices) which brings up Screen Search (previously Now on Tap) and click the pink Reminder button, or we can type ‘Add reminder’ into the search bar or Google app. Both of these routes often feel painfully slow. We do have app shortcuts for Calendar and Keep, which is great. But each app comes with its own feature limitations, discussed earlier, which preclude me from considering either as a viable option. 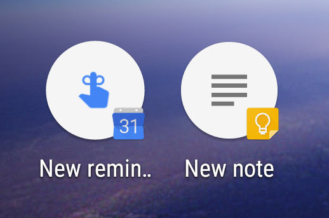 If only the Google app has an "Add reminder" app shortcut or widget, the process would be a breeze. App shortcuts - why can't the Google app copy this approach? If you want to view and manage your reminders list there are several ways to do so. 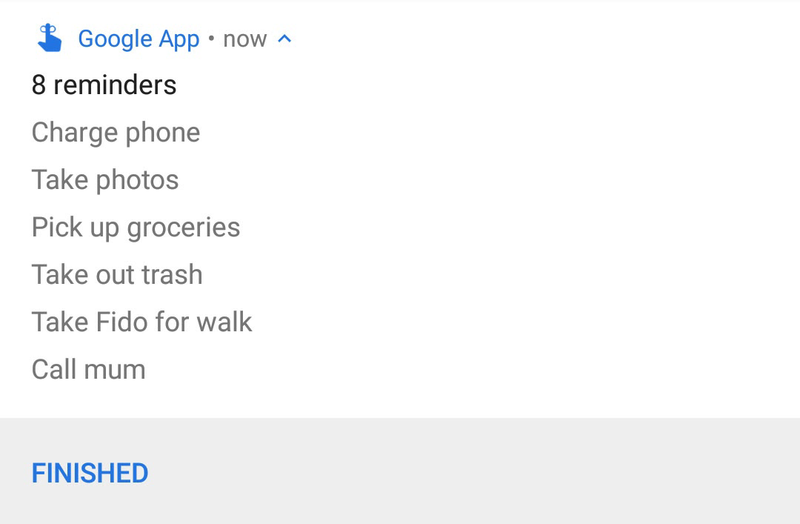 The Google app has a reminders list in the menu, and this is probably the most complete, robust way to manage them. Inbox displays them as pinned items among your emails, or you can filter out everything else and view them in their own list, which functions similar to the list in the Google app. You can also snooze these in Inbox just as you can with emails. Keep has a section showing any notes that have reminders set against them, but doesn’t concern itself with any reminders not attached to one of its own notes. Lastly, Calendar (as you can see in the image further up) displays every single upcoming reminder alongside all of your other events, rendering it practically unusable. More examples of inconsistencies across these apps can be found in the notification shade. How each reminder is displayed and the quick actions associated with each vary widely. To dismiss this I must mark all 8 as ‘Finished,’ including two I can't even see. When you have multiple Google app reminders they are bundled together in a single notification, rather than separated out into individual items. The only action you can perform is to mark all as ‘Finished,’ dismissing every one of them at once. Another thing to remember is that notifications in Nougat only show up to 6 lines of content per app at any one time. So, in the example above there are two reminders I can’t even view without entering into the app. When you do enter into the app to mark individual items complete, that dismisses the notification from the shade entirely. If you were hoping to leave it there for the rest of the day as a glanceable to do list, you’re out of luck. 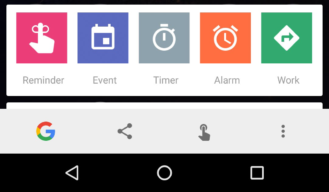 Calendar reminder notifications similarly give you only the option to mark as done, but where they improve over the Google app is that you can tap into each individually and edit the reminder time on the next screen. This won’t affect the other notifications from the app. Inbox notifications are bundled rather more usefully, with each being individually expandable and giving the option to either mark as ‘Done’ or to ‘Snooze’. This offers you greater control over your tasks. While this is much closer to how it should be done, Keep refines this even further. 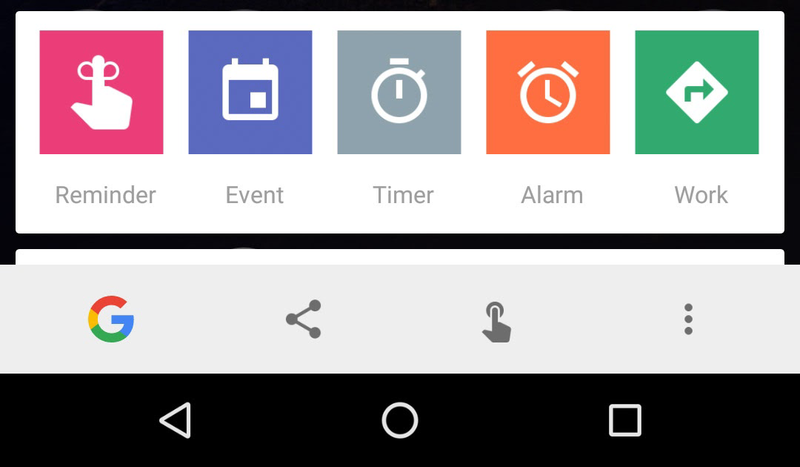 Its notifications are also unbundled and come with two individual actions to choose from, snooze for an hour or snooze for even later. Swipe away the notification and you dismiss the reminder altogether, condemning it to the ‘Past’ section of the reminders list in the Google app. The exception being recurring reminders, which will still come back the next time they are set to recur. This is arguably the best way to handle reminder notifications, but you have to be happy to clog up your Keep list with reminders in order to utilize this. Keep's reminder notification - best in class. Your Google Now feed is yet another place you can interact with your reminder notifications. There, it’s possible to snooze reminders for an hour or mark as finished. But there seems to be little rhyme or reason to how long reminder cards remain actionable in Google Now. It’s not uncommon for me to see a notification in Google Now long after I’ve dismissed it elsewhere, and vice versa. While the cards remain useful in some instances, this isn't a reliable way to manage your task list. Some of you may have noticed that I haven’t mentioned how the Google Assistant in Allo handles reminders. That’s because for some reason these reminders are kept completely separate from all those discussed above. They won’t appear in any of the other apps and can only be viewed in the Allo app when it notifies you. The notification is displayed as a message from the Assistant itself and it doesn’t appear as though you can snooze it at all, not even if you ask really nicely. Allo isn’t the only way to interact with the Google Assistant, of course, the other being Google Home. You might think that reminders would be a key function of the smart home device, but curiously you still can’t ask Home to remind you of something, months after its release. Even the addition of multi-user support hasn't yet brought with it the ability to add reminders. Much has been written about Home and Assistant still feeling like beta products. With omissions like this, it’s hard to disagree with that. 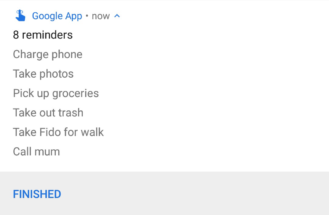 By experimenting with Google’s reminder system across all of these apps and interfaces, it’s probably possible to eventually find a way to make it work for you. I would argue that you shouldn’t have to work quite so hard to utilize what is in essence quite a basic service. I’ve tried countless other Android apps in a bid to satisfy my reminder needs, and effectively replace my defective memory. But nothing seems to hit the right balance of good design, usability, and features. Plus, there’s no substitute for being able to easily access my reminders from any device on which I can access my Google account, something Google’s reminder system still boasts over every other option on the Play Store. Still, there has to be a way to merge all of these separate interfaces and functions into a less frustrating experience. I'm sure this isn't a huge priority at Google, but I can dream, can't I? 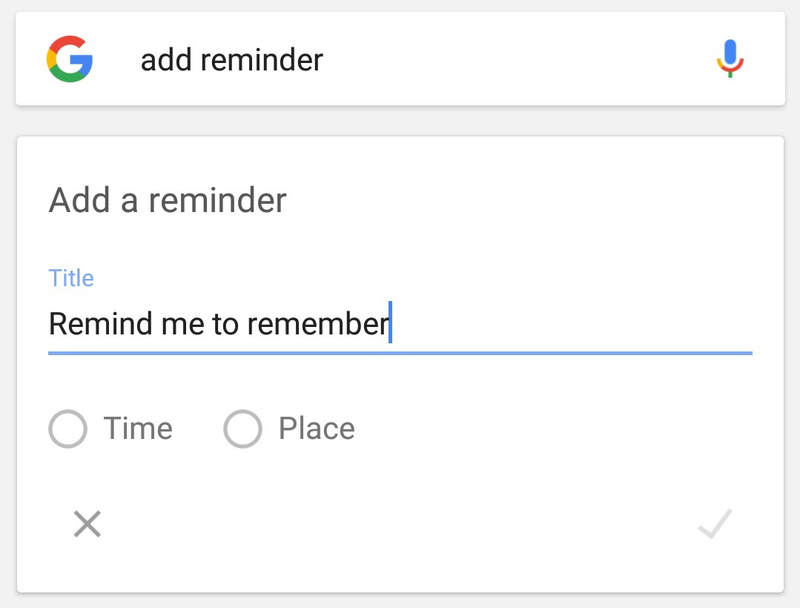 A discrete Google Reminders app would seem an obvious solution. One that plugs into the other Google services but ultimately acts as a standalone master-app might be the best way to alleviate some of these shortcomings and offer the experience I expect from a service like this. Then again, maybe it’s just me. Maybe I’m the only person who uses reminders to quite this extent and I should, in fact, seek help. Hopefully, that’s not the case. And hopefully someone at Google uses reminders just as much as I do, and with just as much frustration.